Located on St-Hubert Street in Old Montreal with 1,080 sq. ft. 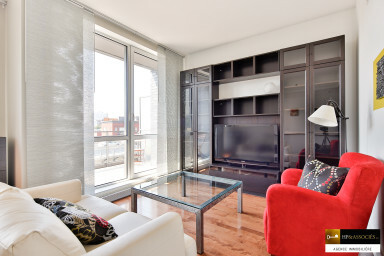 This 1-bed 1-bath condo features split-level layout, 2 private balconies and floor-to-ceiling fenestration. Extensive building amenities include rooftop swimming pool, multi-level courtyard garden and fitness center. Built on two floors and with hardwood floors throughout, this modern fully-furnished condo features exceptional design and all the creature comforts. On the upper level, find a fully-equipped kitchen complete with fitted cabinetry, large island block with quartz countertop and 4-person dining table. Floor-to-ceiling fenestration with private balcony offer great views of the city skyline and make the living room sunny and inviting. Upper level also includes a stylish powder room. On the lower level, find a very spacious queen-size bedroom including work desk and a second private balcony as well as a designer bathroom complete with Zen sink, soaker tub and walk-in tempered-glass shower. When searching for houses to rent in Montreal, look no further than Simplissimmo! Completed in 2013, the modern and dynamic Solano project features 6 phases and a unique lifestyle. Redefining urban luxury, residents of the Solano enjoy first-class building amenities while taking advantage of its scenic location. Each phase has access to the state-of-the-art fitness facilities which include gym, exercise pool with gallery and sauna. The multi-level, landscaped courtyard garden offers a quiet green space and the rooftop sundeck features an outdoor swimming pool and shared lounge. The Old Port is Montreal’s premier neighbourhood. Once the major trading harbour in North-America, Montreal’s waterfront is now host to some of the finest services, attractions and hotspots in the city. Serviced by the Places D’Armes and Champs de Mars metro stations, the Old Port is located right next to the downtown core and is known for its year round activities and fabulous quality of life. Enjoy the Promenade for various rental activities, the Clock Tower for the urban beach and numerous luxury spas such as Bota Bota. With no shortage of popular restaurants, clubs and diverse entertainment, come discover why Montrealers love Old Montreal!